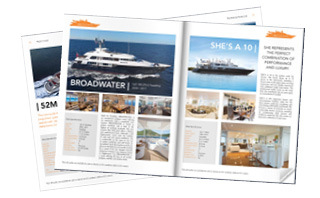 BROADWATER's entirely new interior now includes a six-stateroom layout. A beautiful and spacious Master cabin complete with office lives on the forward region of the main deck with a VIP Queen cabin accessible on the starboard side of the main deck as well. 4 lower king sized guest cabins are in the lower guest area. 2 of which convert to single beds and 2 of which have additional Pullman bunks. The extensive upgrades in addition to the completely new interior included all new lighting, AV, furnishings, floorings, exterior paint and much more. Entering BROADWATER from the formal entrance, on the starboard side, one will land at the formal foyer. Within the foyer, one will find a stunning spiral stairway that leads up to the bridge deck or down to the lower guest accommodations. The entire facade of the spiral stairs has an impressive metal finish manufactured by Neal Feay and inspired by the Japanese practice, omikuji (Japanese fortune-telling paper strips that can be found at shrines and temples), creating multiple layers of reflection, transparency and gradient coloring. From the foyer area one can go aft to the formal dining and main salon or forward to the on-deck master and VIP cabins. The main aft deck is host to a wet bar with four bar stools and settee with table and chairs, perfect for sitting, dining or watching the watersports below you. Descend the aft wide spiral staircase to reach the swim platform complete with shower for easy access to enjoy all the water toys. Just off the swim platform one will find the perfect water sport staging area in the beach club arrangement offered in the lazarette. A beautiful and spacious Master cabin complete with office lives on the forward region of the main deck with a VIP Queen cabin accessible on the starboard side of the main deck as well. 4 lower king sized guest cabins are in the lower guest area. 2 of which convert to single beds and 2 of which have additional Pullman bunks. From Wales in the United Kingdom, Mark has been a keen sailor since the age of 7. Having been a member of the Royal National Life Boat Institute for 3 years, he gained experience in boat handling and working under pressure. Mark has worked his way up in the yachting industry since 2007, crewing on large 252ft, 200ft and 180ft yachts, acquiring much private and charter experience. 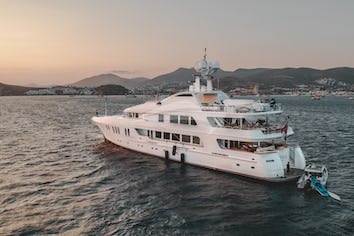 He has gathered vast yacht location berth and anchorage knowledge, including, but not limited to the Black Sea, the Red Sea, the Indian Ocean and the Adriatic Sea. Mark completed his MCA 3000gt Master license in 2016. He has been a part of the BROADWATER program since 2014 and this is his third vessel with the owner. 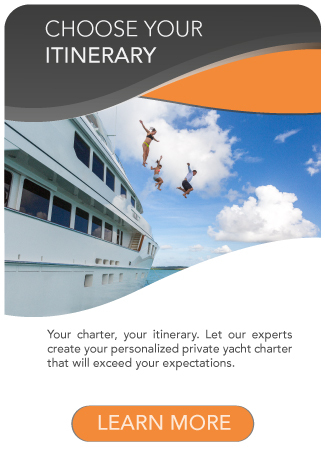 He loves all things pertaining to the sea and will ensure that your time spent partaking in seafaring activities is thoroughly entertaining and safe. When Mark isn’t overseeing your flawless experience, you can find him at home in North Carolina with his wife and daughter. Ben grew up in the Turks and Caicos Islands and has been around the water his entire life. At a young age his family lived on a sailboat and after going shore based they continued to be avid boaters. When he eventually left the islands he immersed myself in the South Florida marine industry and took over his father’s yacht repair business in Fort Lauderdale. He then made the move to professional yachting over 11 years ago and found it to be the perfect combination of his skill set and passion for the ocean. 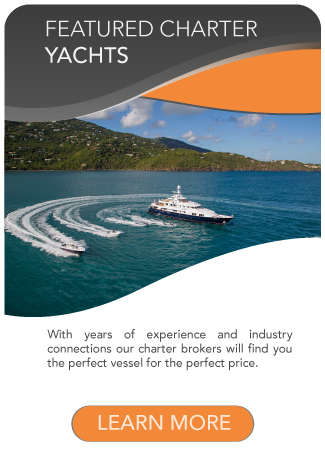 Ben has commanded vessels of varying sizes and has a plethora of charter and navigational experience. 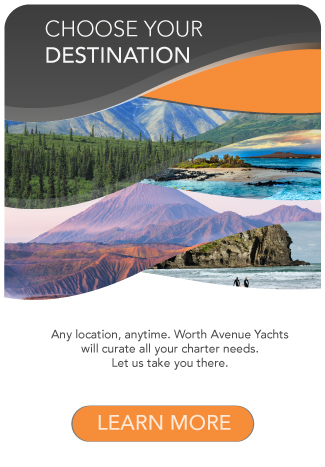 He is thrilled to join the BROADWATER team and provide your clients with the charter of a lifetime. Lance grew up between a cattle ranch in Zimbabwe and a quiet suburb in Johannesburg. Most of his enthusiasm for the ocean started at the age of 12 when he sailed the Greek Islands for 2 weeks in 1999. After finishing his degree in Finance and Accounting in the States, Lance decided to put off becoming office bound and work to save the money to start a career in yachting instead, by managing the flagship store of South Africans version of Abercrombie & Fitch. After 15months he had reached his goal and set off for the South of France to find his dream job. Lance has his MCA Chief Mate 3000gt license and working towards his Master 3000gt license. With over 6 and half years of sailing and working on large yachts worldwide, Lance joined Broadwater. 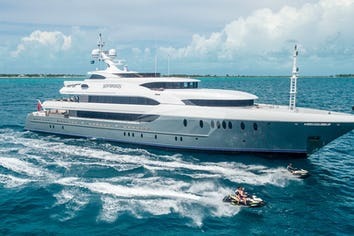 Enjoy an exotic cocktail while Lance and his dedicated deck team plans your perfect day on the water, water sports activities or excursions ashore. Originally from just north of Chicago, Austin Miller spent much of his childhood traveling with his family. He spent a few years living in a small town outside of Paris and believes it was then that he developed a strong desire to see the world. Austin obtained his Bachelor's degree in Mechanical Engineering and Economics while playing Division 1 baseball throughout his studies at Butler University. Not being able to fathom a life behind a desk, he set his sights on the world of yachting and headed to Florida. It is his hard working attitude, active lifestyle, and love of travel that lead him to his newly found nautical career. In his spare time, Austin enjoys anything and everything outdoors, he is an avid backpacker and has a growing interest and passion for drone photography/videography. Sam was born and raised in Napier on the East Coast of New Zealand. Sam grew up playing a lot of sports, predominantly rugby and surfing. He studied for 4 years at Victoria University and came out with Bachelor of Tourism Management and A Bachelor of Commerce Majoring in Marketing. Soon after Sam decided to join yachting and has been in the yachting industry for almost 4years and has enjoyed every minute of it and looks forward to welcoming guests onboard Broadwater. Sam loves all things outdoors and on the ocean. His favorite hobbies include surfing, traveling, playing the guitar, hiking, diving and fishing. Gareth is originally from Durban, South Africa, though he grew up in Maryland from the age of 8 years old. He pursued general studies in college for two years and upon finishing school he transitioned into a role in his father’s carpentry business, though he had truly started learning the trade long before college and hence massed over 10 years of carpentry experience before following his love of the water onto his first job on a yacht with team Broadwater. To say that Gareth is excited to be here is an understatement. In his down-time you will find him playing soccer, surfing and fishing. Rebecca was born and raised in the heart of the Colorado Rockies. She has a Bachelor of Arts degree in Journalism from the University of Colorado, Boulder and spent four years after university living and working in Argentina. Rebecca interned at the US Embassy in Buenos Aires in the Press and Events Department, as well as carried out a number of Personal Assistant roles during her time with the State Department. 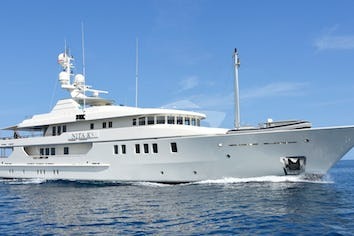 She moved back to the US five years ago to pursue a career in private service and attended Butler School in Denver with the intention of going into estate management, however, she was intrigued by the yachting industry and decided to try her hand at private service by sea. This is her tenth season in the industry and Rebecca’s outgoing personality, passion for service and love of travel keeps her enthusiasm for her job in full bloom. Rebecca is committed to exceeding guests’ expectations while enjoying all of the unique experiences, opportunities and challenges that the yachting industry has to offer. Her hobbies include learning languages, exercising, yoga, skateboarding, basketball and real estate. Leigh-Anne is from Johannesburg, South Africa. She completed her degree at university in Hospitality Management where she gained a thorough general knowledge of customer service, management, housekeeping and laundry skills which prepared her well for her new venture in yachting. Broadwater is her only vessel and she is thrilled to be a part of our team. Prior to yachting, Leigh-Anne was employed with a leading luxury tour operating company and during her time there her desire for travel increased immensely, hence securing her desire to set out for the USA and secure a position on a motor yacht as a Stewardess. Leigh-Anne loves to hike, travel and has a great interest in photography and the outdoors. Gaylaine, was born and raised in the metropolitan city of Toronto, Canada. At an early age, she discovered her love of travel as her large family would take road trips every summer; her highlight being Highway 101, touring down the West Coast of the USA. Having a love for the outdoors, Gaylaine enjoys skiing, kayaking and hiking. She is bilingual, speaking English and Cantonese. She worked as a lifeguard throughout high school and studied, Psychology and Anthropology in university. Longing for a change of scenery, Gaylaine moved to Antigua in 2013, where she attended medical school. Enticed by the surrounding waters and variety of yachts anchored in English Harbor, she decided to transition into the yachting industry where she has been able to explore more of the world. Heavenly grew up in a small beach town on the central coast of California, giving her an innate love for all things oceanic at a very young age. Prior to joining the yachting industry, she traveled Europe volunteering at refugee camps and dedicating all of her time and energy in the service of others. Heav is full of life, enthusiastic, has a positive outlook and is adamite about creating an unforgettable experience for those lucky enough to have the Broadwater experience. Giselle was born and raised in San Pedro Sula, Honduras where she worked in Business Administration. Giselle then moved on and completed an internship at Disney World, after which Giselle decided to join the Disney Cruise Line and took the needed courses to apply for the job. However during that time she learned about yachting and decided to switch her path and give Yachting her best effort and has not looked back since. Giselle enjoys learning all aspects of the interior and what it takes to have it run efficiently. Gisselle enjoys traveling, reading and scuba diving. Scott is from Durban, South Africa. He worked as a diesel mechanic for Caterpillar in South Africa and then began working on an oil rig before joining his first yacht at the age of 21. He started in the industry as a deckhand prior to transitioning into his true passion of engineering. His favorite part of his job is the challenges he is presented with and subsequently finding solutions for them. Scott recently purchased an equestrian farm in South Africa and he enjoys spending his time away there as well as free diving and spear fishing. Theo was born and raised surrounded by the breathtaking natural scenery that is Cape Town, South Africa. His strong love for the outdoors landed him a position as an adventure tour guide throughout the whole of Africa, showing tourists everything from the Namib Desert to Zambia’s Victoria Falls. In 2009 Theo embarked on a new adventure on the sea and his engineering and travel skills married happily with his transition to the world of yachting. Theo has been trained by a number of the best engineers the industry has to offer and recently achieved his Chief Engineer (Y3) License. When he isn’t working (which is rare!) you can find him exploring the outdoors, hiking, watching sports and spending time with his family in South Africa. challenge to date. In 2010 Will and his friend broke a world record by becoming the youngest pair to row the Atlantic Ocean in a race that spanned 80 days at sea. It’s from this experience that Will found out about yachting. He spent the last three years studying Marine engineering, at the renowned Warsash Maritime Academy in England, and is now loving his new life in Yachting.